So as soon as there were several complaints about no gallery, the devs put up that the gallery will b in the NEXT update? They must b smoking some shi**y a** weed! Ok, High Times does not load on iPad. No gallery. Only works in portrait mode. No Strains app, or any way to get it. The only thing this app does is aggregate news. Terrible. I can get the same news with Sky News or any other news aggregator. What a ripoff. Perfect for keeping up as the dominos fall. Fix this update, I use it almost daily. An easy to use news finder for anything marijuana related. As a medical patient it's nice to be able to reach into my pocket and pull up all the latest canna news updated as quick or even quicker then my local news sites. 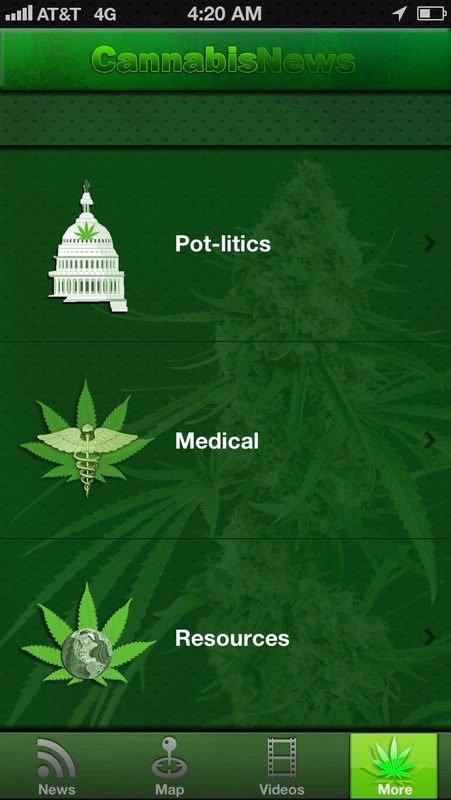 With medical marijuana at the top of today's news stories it's nice to have an app. like this that makes finding information as easy as a few simple finger taps. After only 1 update this application has passed all expectations can't wait to see what this dev. team has in mind for later updates. Super dank, a must own! Frozen on blank hightimes screen!!! It's nice to know that the developers are listening to the comments left in the reviews, the latest update adds a lot of the features that people have requested. They have added the much needed in app browsing of stories, which was my major gripe with version 1.0, so it no longer ejects you to safari to read the story you selected. They have also polished up the interface greatly, icons now appear for the news sources like they do in the screenshots, and it seems generaly more responsive. Although there could be a improvement in the speed that articles load, it in no ways detracts from the experience. With this update I can now safely recomend this to any marijuana activist, or someone who is just looking on catching up with all the devolopments in the marijuana culture. I love pretty much everything about this app. I enjoy having all of the most recent MJ news updates all in one place. The only downside I can think of is that the app occasionally crashes. That's the only thing keeping me from giving this 5 stars. Hopefully it's an easy fix. Maybe in the next update? Awesome!!! Best app of all!!! You just cannot go wrong here! 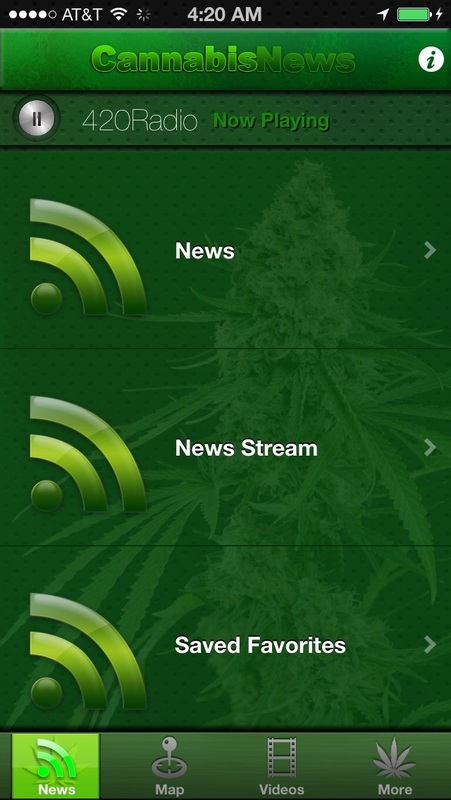 It's Everything you need, Plugged into all kinds of different news streams, Dispensaries, Laws and videos!!! I'd buy it again! If this is an update it needs serious fixing. Crashes every time I try to connect to a link. The previous version worked well but could have used fine tuning. Unfortunately it's now pretty useless. 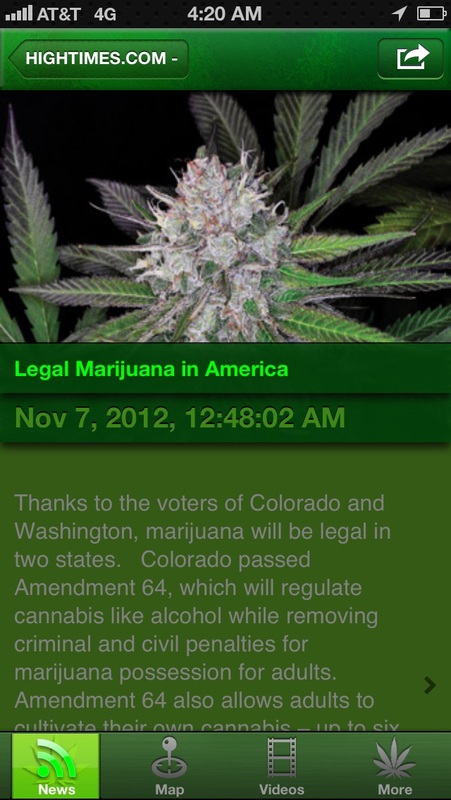 This is a great app that keeps up data on news and laws you need to know. Perfect for staying updated on news for my blog! Thank you for making this! My only qualm is that the recipe section doesn't seem to work. I select it but the screen stays the same :( please fix! This app has a lot of good looks to it but that's all it has cause it doesn't update all of there news sources an most of the time u can just download the apps it's getting it's info from an get the news faster instead of a delayed pile of crap. 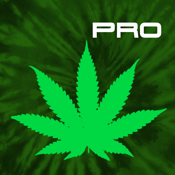 For truly the best cannabis news get the individual apps like NORML and Hightimes for accurate an up to date news. Every time this app gets updated it's Chuck full of bugs. Crash crash crash crash. Do you guys even tested before you put it up. High Times don't load. Gives error code 68. Was working until a couple days ago. Need big fix bad. Otherwise, it will be ok. Shuts down the whole app. I hate paying for something that I can't get. I like it. How much is it? It don't matter I'll take two. It just sits there doing nothing when I tap on any link. I have an iPod 3G & when I opened the app, a message popped up saying I didn't have a GPS feature. Do I need an iPhone for this to work now? Wow, I paid for this? If you want to stay informed of news and current issues in this area of interest this is a great place to go. Crashes 90% of the time after reading an article and hitting the back button please fix ! This app used to be great until the read more links stopped working. You cant even read an article anymore. I was sure this would be fixed very soon, along with a few other minor ipad issues. What happened? Sad to see this happen. I really enjoyed your app. This thing never works. Get a new programmer. update to support multitasking! leave the app in any way and next time you open it you're all the way back at the home screen...a major nuisance. besides that it's good. All the up to date news in one easy to access app. Fantastic work!!!! Thank you! 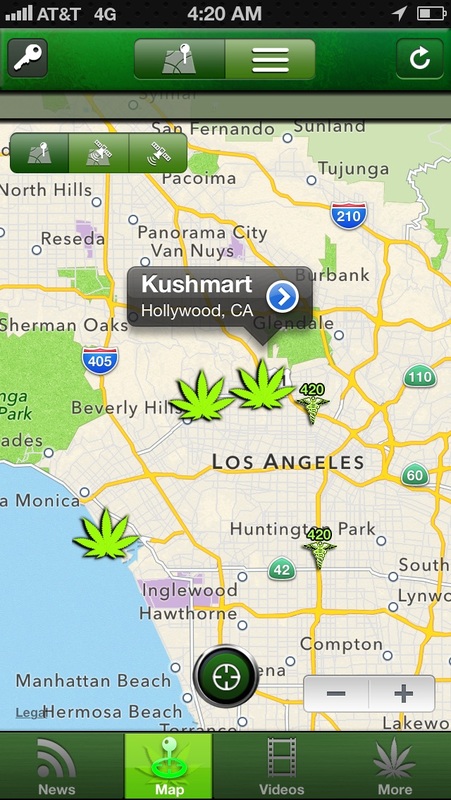 This app will help me know where and when new states will legalize weed, hoping the nation will come to its senses and let this stuff become legal. I withdraw my previous review and would like to submit this one. This app started out to be a great app, it's very informative and has good potential however the developer wants people to rate this app positively in order to unlock some of the goodies in the app. Also I would like to mention that the newsfeeds are somewhat jittery and videos portion is not updating properly. After a month I'm wondering why I paid for this app!!! Never had the older version, but the current version doesn't even function on the iPad. Please give us an update that will fix this. App crashes at start! Please fix! Please fix this. The app crashes while opening every time. I love this app... It's like have a subscription to over 40 magazines, including "High Times" & "Canabis Now"... The news feeds are very current... The video catalog of "How to grow" and much more is great... And the Radio Stations are a BRILLIANT touch. I got to say 100% love this app all the way around. Keep up the great work. Love this app. The news stream saves me time by aggregating news from many different sources. My only request is for multitasking support, I would like to resume reading an article when switching back between apps. Other than that it's solid. This is a great app! But just wished the videos worked :( Other than that it's perfect! Love it! Please fix videos Tan ku! "5.1" must be a misprint. Upgrade crashes instantly and consistently. iPad Original holdouts just lost one of our neatest apps. The lite Cannabis News states 6.1, so maybe the developer was thinking iPad 2's & on? Continual updates with lots of new sources of information. Well worth the price if you want cutting edge news and info on cannabis! Thank you for this great app. All the important news of the world here! Every time I open link the app crashes on iOS 7 and 8. Old version worked fine though. Please fix. Please fix the newest update. Nothing is working. The app either crashes when I try to open, or else the news feed only loads old feeds.